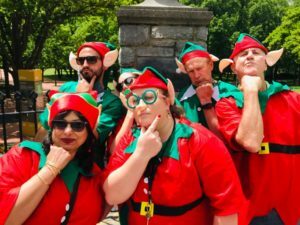 Santas elves have lost the Christmas presents, complete a fun team building treasure hunt to find the Treasure Chest filled with bounty at your secret work celebration venue in The Rocks, Sydney, Parramatta, Manly, Bondi Beach or Gold Coast. Naughty or Nice!!! Treasure Hunts will provide a disadvantaged child a seriously fun Santas Chrissy toy gift valued to $250! Yes those mischevious elves have begun to party because the Christmas season is near. Alas they hid the treasure chest where Santa would not trip over it. But now is the time to open the treasure chest. 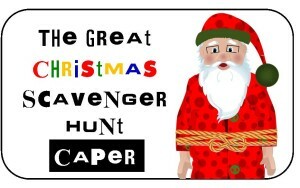 Can you help our elven friends follow the treasure trail clues. Collect Scavenger Hunt items and unlock the bounty in time for Christmas drinks at your favourite pub, cafe or functions venue. I know what you’re thinking. Skip merrily or prance to the end location like reindeer or become a mutineering pirate and take the loot yourselves. Wrong – That’s not the Christmas spirit. The journey finding clues and discovering more of Sydney, its beaches or The Rocks, Barangaroo, Darling Harbour and Escape Cockatoo Island activities is the best and most engaging part. Well lend me your elfen ears, here’s the inside elf gossip. But only special Christmas parties team that have the skill. For each successful unlocking. Treasure Hunts will provide a disadvantaged child a seriously fun Santas Chrissy toy gift valued to $250! 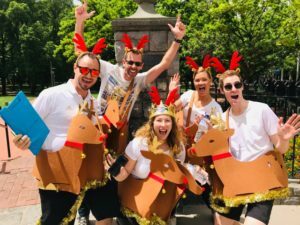 Get safe cracking now and book your Christmas work party team building celebration end of year function for staff and employees. To bond on an activities spectacular. Seasons jolly event. A terrific reason to book the professional group activities crew. That will have your business team cheering for Santa! Lets get dressed up in fancy dress – Dasher, Dancer, Prancer, Vixen, Cupid, Donner, Vixen, Prancer, Comet, Dasher…… and Rudolf.